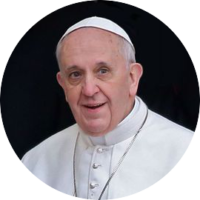 Saturday: After the 6.00pm Vigil Mass. 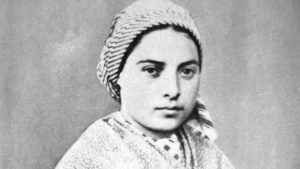 Saint Bernadette was born in Lourdes, France on 7 January 7 1844. On Thursday 11 February 1858 fourteen-year-old Bernadette beheld an apparition of the Blessed Virgin Mary, seventeen more apparitions would follow. During the apparitions Mary asked for the building of a Church, revealed the location of the holy spring at Lourdes, and asked for prayer and penance. She entered a convent of the Sisters of Charity on 29 July 1866 and lived the rest of her life as a nun. She died on 16 April 16 1879, age 35. 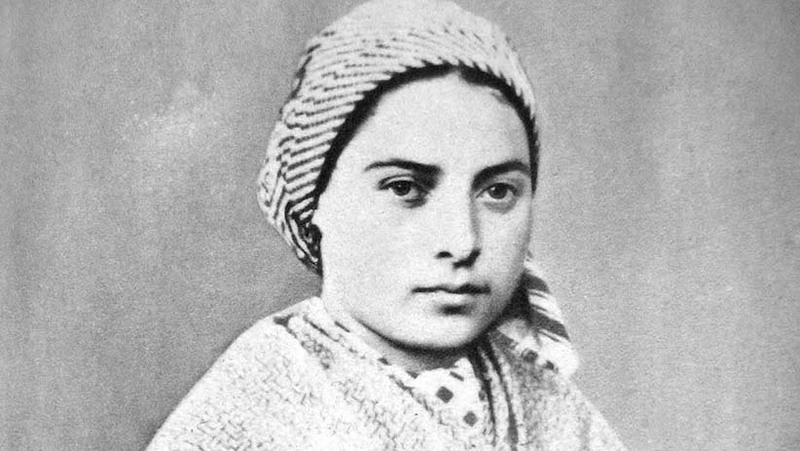 Saint Bernadette was canonised by Pope Pius XI in December 1933. 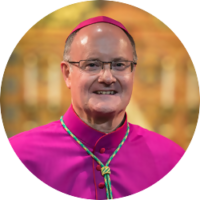 As well as being our patron she is also patron of illness, people ridiculed for their piety, poverty, shepherds, shepherdesses, and the town of Lourdes in France. Her feast day is kept on 16 April. The 19th century saw the expansion of Bolsover from a picturesque market town, dominated by its Castle, to an important mining centre. This brought in some Catholic workers, for whom in 1903 a wooden hut in High Street was acquired as a Mass centre, served from Shirebrook. In 1942 a new Mass centre opened briefly in an upper room in the Market Place, but in the following year a property at no. 59 High Street was acquired and an adjacent stone barn fitted up as a chapel. This remained in use until 1967 when the present church was opened, built from designs by John Rochford & Partner of Sheffield and Manchester, seating 197 and costing £20,000. The barn continued to be used as a parish social centre, until sold in 2005 to fund renovation here and at Shirebrook. 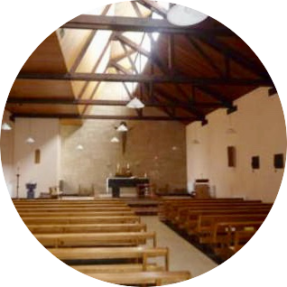 The church is situated on a confined site in the centre of the village adjacent to the old barn which previously served as the church. It is a simple rectangle on plan, comprising a nave and sanctuary, with the sacristies, confessional, baptistery and side altar on the north side. It has an asymmetrical roof with a raised clerestorey on the south (geographical northwest) side. It is stone faced, with a stone slate roof. The main west front has an asymmetrical arrangement of windows, possibly inspired by Le Corbusier’s chapel at Ronchamp, and a projecting porch with entrance at the side.